Special Offer: $20.00 off when you mention KidsLinked. Discover Modeling Inc. (DMI) is a finishing and modeling school in business over 20 years. The mission is help people gain self confidence through visual poise and posture. First impressions are ever lasting, and DMI can help you discover yours. DMI is not only for potential models but also for those seeking to improve self confidence through visual poise and posture. Discover Modeling also teaches make-up, wardrobe and table manners along with other social graces. Workshops and camps are all age appropriate. 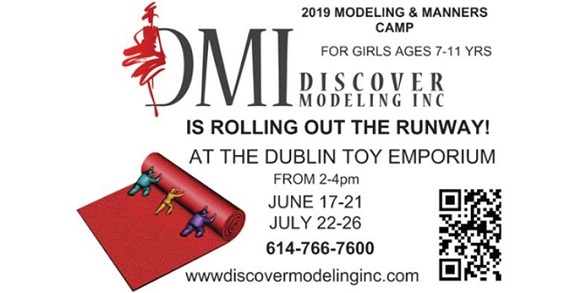 Join Discover Modeling for girls only Summer Camp! Two sessions are available! Summer Camp at The Toy Emporium June 17-21 and July 22-26, 2019. Workshops will be held that focus on may areas such as: visual poise and posture, hair and makeup, terminology and techniques. Discover Modeling also offers Fashion Show Birthday Parties, Girl Scouts, Summer Camps, Bridal Party Workshops, Pageant Training, and even Corporate/Business Seminars and so much more!